When I was a little girl, there was nothing quite like my grandmother’s cheese toasty sandwiches and Campbells Cream of Tomato soup, reconstituted with milk. She would spread CheezWhiz on white bread and pop it into the toaster oven until the cheese bubbled. I know. Awful, right? But that’s what love tasted like to a five year old. There are many winter days when what I want for lunch is a ramped up version of my childhood comfort. 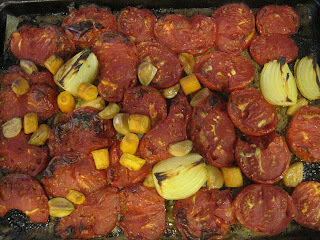 The time to plan for those winter days is now – as the tomatoes fade from the markets. I take thick pieces of challah or Italian loaf, a slab of Fontina or Cheddar, a swath of apple chutney or fig jam or peach salsa. Sometimes, it’s pieces of pear with Brie, or nectarines and mozzerella. Sometimes it’s Comte and bacon. Grill the sandwich in plenty of butter. Weigh it down with a pan and a tea kettle. Let the cheese warm slowly until it’s all melty.Let the sandwich rest for a moment or two after it comes out of the pan, then cut in half to serve. And the soup? Rich and tomato-y, whispers of roasted sweet garlic, hearty chicken broth as a base, and basil brightness. Top with a dollop of creme fraiche or sour cream. Or just stir some heavy cream into the soup as it heats. Roast at 425°F for about an hour, or until veggies are roasted and a little blackened. To serve: Warm soup in a saucepan. Add cream to taste. Serve garnished with chives or frizzled shallots. Good heavens but this looks good…Weather is cool enough to wedge this into my meal-planning, maybe bump ahead to first place! I trying this tonight. The grilled cheese will be mozzarella with pesto. 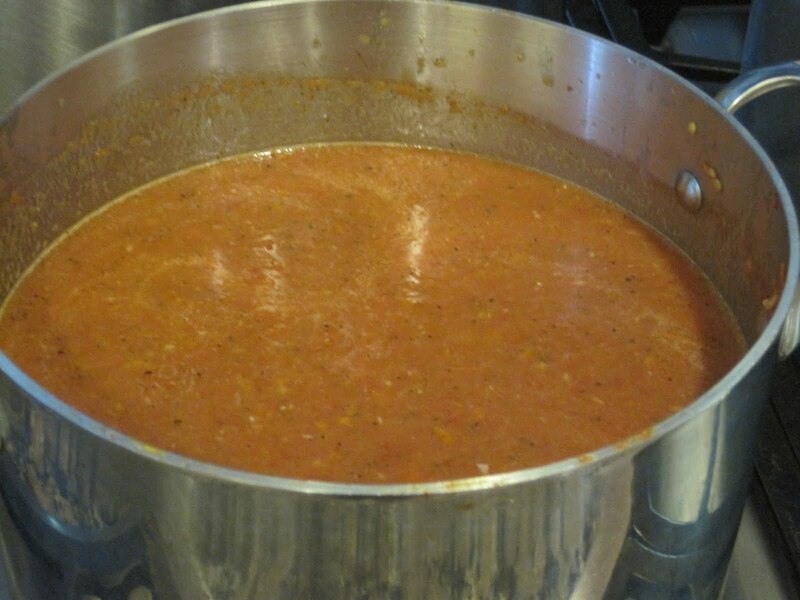 I literally was thinking about tomato soup and a grilled cheese sandwich yesterday on my way home from work and thought that I needed to find a good tomato soup recipe. THANK YOU! I will try to make this during the weekend. Will get my supplies from the White House Farmers Market today! this looks great! i've never made homemade tomato soup before, but this looks sooooo much better than that stuff in a can! Lovely! I made the lemon thyme configure you featured on NPR and now can't wait to make this soup. Somehow they seem to want to be consumed at the same time — a grilled cheese to be their common friend. Thanks! Love your blog Mrs. W! that sounds awesome. I love grilled cheese & tomato soup – and since we're having a fall drizzly day today, I might have to find some for lunch. Hi! I made your recipe for fig confitures and they look lovely but I have a processing question. I ended up with more jam than I could put in jars and process at one time and I put the remainder in the fridge. I have enough to fill several more jars. Can I reheat it and fill additional jars and process them safely? This would be a day after I made the recipe. Hi Lisa, so glad you made the jam! Yes, just bring the figs back up to a hard boil, then process. I made this soup today with tomatoes and basil that I bought at the farmers market. It is so delicious and healthful. I’m watching my calories and trying to lower my sugar and salt intake as well as doing my best to eliminate procesed foods from our diets. Next time I make the soup I will also roast extra vegetables so I can serve them on pasta and save the soup for lunches and dinners. Thank you! Just happened onto your website. Since it’s usually hot when tomatoes are ripe, I roast my tomato soup on the gas grill outside. You have to stir it often to avoid too much char, but it works beautifully! By the way, I am also wanting to make peach cobbler, minus the cobbler, to pressure can. Do you happen to have a recipe for that? Can I use vegetable broth without damaging the flavor? Yes, you can use vegetable broth. As to what that will do to the flavor, I really can’t say! But there’s no reason this can’t be a vegetarian soup. I just made this and it is AMAZING!!!!!!!! Thank you! I made this and canned it. I made the rookie mistake of leaving the peels on the tomatoes before canning. Ruined the batch. I have been so excited to make again. I might can again. I’m a little skittish. This is one of the best soup mixes I’ve made. I plan to make as much as I can this year! Thanks for your recipe. Hi Kim again! Processed a batch 2 weeks ago. Pulled skins & whoop whoop success! Just tested the jar after pressure canning. So glad I just bought 75# more to play with today. Thanks again for a great recipe! 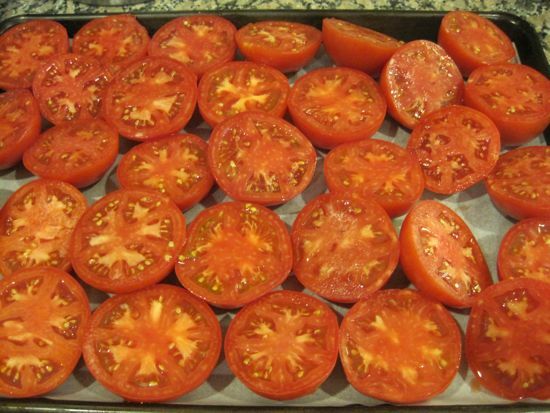 The Washington DC farmers markets are full of tomatoes, here’s how to preserve them.